Nobody wants to think of their teeth as breakable. For most of us, the thought alone is enough to give us a shudder. If you ever chip or crack a tooth, however, it is important that you know what to do, are prepared to take action, and, above all, don’t panic. Today, we’ll shed some light on what to do if you or a loved one damages a tooth. If you or a loved one ever chips or cracks a tooth, it can be easy to panic, but always attempt to remain calm! Familiarizing yourself with the possibilities and options availabilities to you can save you a good deal of frustration and anxiety in these situations. Typically, a cracked or chipped tooth will be accompanied by almost no pain or ongoing discomfort. In fact, most patients are surprised by how little they feel when their tooth gets damaged, remarking that, without touching the damage, they could forget it was there entirely. Now, if you’re in the opposite boat, experiencing a good amount of lingering pain, then you may want to consider a visit to the emergency room. If possible, contact your dentist’s office first to get confirmation that this is the best course of action; sometimes, it is best to visit a dentist right away, but you shouldn’t think of pain with a chip or crack as acceptably normal. Just remain calm and take the steps that your dentist and/or doctor outline; everything will be okay! 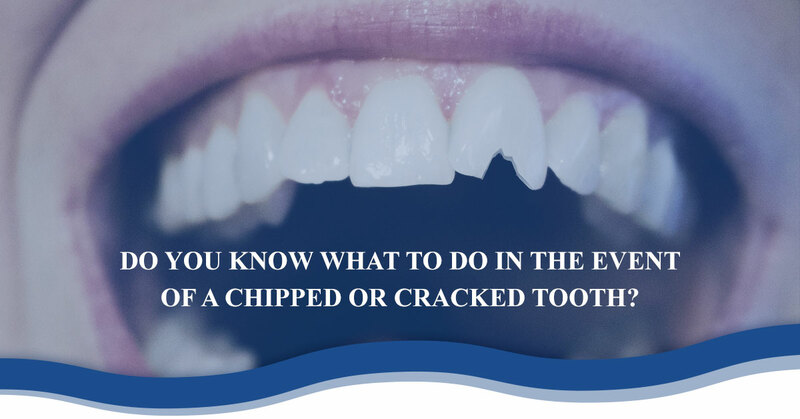 As mentioned above, you may not experience any pain or discomfort from a chipped, cracked, or even broken tooth, but that does not mean that you should go on using the tooth as if nothing has happened! You should contact your dentist’s office and explain the type of fracture; they will be able to advise on what to do about it and whether or not you should avoid any (or all) foods and beverages. As a rule of thumb, if you have a small chip or damage to the end of a tooth, it’s likely okay to carry on with your normal activity, but a crack or major fracture can be very dangerous if agitated any further, perhaps even costing you the tooth, so be sure to act with appropriate caution. Depending on the damage to the crown (exposed portion) of your tooth, your dentist can pursue a number of treatments. For instance, minor chips don’t always need treatment at all, or can be treated by simply polishing and smoothing out the area to mask the presence of the chipped portion almost entirely; a more serious break, however, can lead to a root canal treatment if the nerves inside your tooth have been exposed, a crown, or even tooth removal, all depending on the specifics of your case. Sometimes, cosmetic solutions, like a veneer, are the best option for a visible surface fracture or chip, even if the damage isn’t actually structurally worrisome. Regardless, your dentist can recommend one or more treatments for any type of damage to your tooth’s surface; the important thing is that you give them a chance to diagnose the damage as soon as possible! If you aren’t the one to experience this, then you will likely serve the vital role of keeping the person with tooth damage calm and taken care of. Follow the above guidelines the same as you would for yourself, but be sure to reassure the person that no damage to a tooth is unfixable; they will have options for the most minor to most severe tooth issues once they see their dentist! For major breaks and damages, it is often recommended that you have the person rinse their mouth with warm water, stop any excessive bleeding with gauze, and then apply a cold pack to cheek or lips over the impacted area while you contact their dentist’s office and/or a nearby hospital. Whether or not they seek treatment right away, you should always urge them to visit a dentist about their issue in the near future. At Balboa Victory Dental, we understand that accidents can happen at any time to anyone. If you or a loved one in the Encino or Lake Balboa area have a dental emergency, no matter how slight or severe, feel free to contact our office for your next best steps and maybe even a same-day appointment to see our dentist. Our dentists are more than happy to help with routine care and more pressing matters alike, so give us a call whenever you need dental advice! Contact our office today for scheduling availability or more information!